Editor’s Note: Next week, the 2017 Israel AgTech Innovation Showcase Delegation, organized by The Israel Economic Mission to the West Coast, Israel Economic Mission to the Midwest, and the BIRD Foundation, will take place. The delegation will stop in St. Louis, San Francisco, Salinas, and Encinitas. The delegation will include startups specializing in crop protection, crop nutrition, plant genetics and breeding, irrigation, and decision support technology. Participating Israeli companies include AgriTask, AutoAgronom, BioDalia, BreedIT, Future Tense, Groundwork BioAg, Pimi Agro Cleantech, Prospera, Saturas, SMART!, Taranis, Tevatronic, and the Israel Cleantech Ventures. Here Maya Vardi-Shoshani, head of the West Coast Division at the BIRD Foundation, who is speaking at the event, describes the work the foundation has been doing to promote partnerships between US and Israeli agtech companies. The Bible named it the land of “Milk and Honey.” Yet, the small country of Israel, with a geography that is not naturally conducive to agriculture, with minimal fresh water, has faced many great agricultural challenges. Most agricultural areas are located in semi-arid climates with unsuitable soil for many crops. Population growth is expected to increase the urban demand on water and further limit the available land resources available for agriculture, while simultaneously requiring an increase in food production. But, the country’s scarce natural resources have promoted the development of numerous creative solutions. A thriving, local ecosystem for agricultural technologies, together with a culture of multidisciplinary problem-solving, has empowered Israeli entrepreneurs to address agricultural challenges such as climate change and water scarcity. Israeli innovators have introduced transformative technologies to the world such as drip irrigation, desalination, and water reclamation. Israel has also become a major exporter of fresh produce. It exports an estimated $4 billion a year and has around 280 agtech companies, exporting 200 agtech services and products. In 2015, the country was making approximately $90 million of yearly investment in agtech-oriented R&D. Israeli agtech innovators are particularly strong in seed production, plant genetics, and breeding. Developing crop varieties that can grow in problematic soil regions, like areas with high salinity, significant water stress, and high acidity levels are important with increased instances of droughts, floods, heatwaves and other extreme weather events. Needless to say, in the area of water management and in particularly precision irrigation, Israel is and continues to be, a global leader. As they say, necessity is the mother of invention! Israel is a very small market, and startups complain that it’s hard to identify local distribution channels for their technologies and services. This makes it hard to scale up. One strategy used to penetrate a non-local market is to form an industrial partnership with a firm in the target market. Technological innovation is recognized as the main factor in the growth and success of many firms. In certain fields, a company has little chance of survival without innovation. Large, existing firms have discovered that cooperation can greatly enhance their innovative capabilities. In this context, international cooperation has become an important part of doing business for companies constantly seeking novel approaches for overcoming their competition. Exporting Israel’s ag technologies and expertise has been a priority for the government for many years, especially to the US. In 1977, with the goal of promoting breakthrough technology and innovative research and development, the US and Israeli Governments established the US-Israel Binational Industrial Research and Development Foundation (The BIRD Foundation) to invest in collaborations between companies from both countries. The BIRD Foundation (BIRD) works to encourage cooperation between Israeli and American companies in a wide range of technology sectors by providing funding and assistance in facilitating strategic partnerships for developing joint products or technologies. BIRD supports projects without receiving any equity or IP rights in the participating companies. We provide non-dilutive funding and support of up to 50% of a project’s budget up to $1 million. Our support begins with R&D and ends with the initial stages of sales and marketing. Since 1977, we’ve granted over $340 million to over 940 projects, investing up to $1 million in each. We only require repayment if the project achieves sales. Between 2015 and 2016, about 15% of projects supported by BIRD –- after review by the Israeli Office of the Chief Scientist and by the US Department of Commerce’s National Institute of Standards and Technology (NIST) — were in agtech. BIRD funding can be a catalyst to an emerging partnership. Our highly networked team can be very instrumental in helping a company to find the right partner. We hope our funding also allows small firms to reach the milestones necessary to make them attractive to venture capitalists and to take their ideas to the next level. BIRD has supported agtech projects with both large and small US companies. A collaboration between Californian company Marrone Bio Innovations (MBI) and Israel’s Groundwork BioAg was approved and funded by BIRD in 2015. 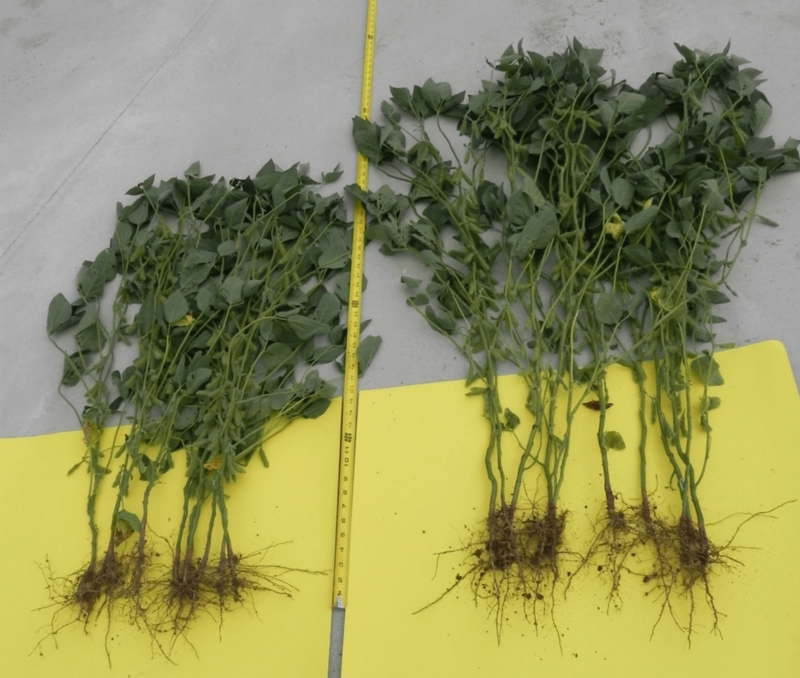 Image from Groundworks Marrone Bio Innovations project: Soy Bean Field Trial Yield Results, Pioneer Seed Varieties. In recent years, we have paid close attention to the field of precision agriculture, as we saw tremendous potential in advanced data analytics and the use of big data in increasing food production. We are also interested in companies that integrate software and hardware solutions and allow efficient farming practices that have the potential to reduce operational costs. Being a well-known center of excellence for the high-tech industry, Israel has a lot to offer in that respect. We see a very rich local pipeline of companies that can participate in these segments. You can contact Maya Vardi-Shoshani here.